The sun was out on the weekend, so I grabbed my holos again and played around with one of the temporary tattoo designs I had printed. This one didn't quite turn out how I had imagined in my head. On the paper these were beautiful enlarged brilliant cut diamonds that showed all the facets in different shades of grey. But on my nail they look more like star bursts or shards of glass or something?!?. I'm not going to call it a fail, just different to what I had imagined. This photo in the shade shows the shades of the faceted diamond better, which seems to get lost amongst the holo. 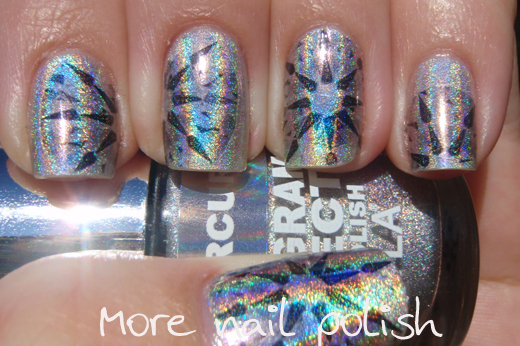 Still, it was something fun to spice up a holo polish, especially indoors. 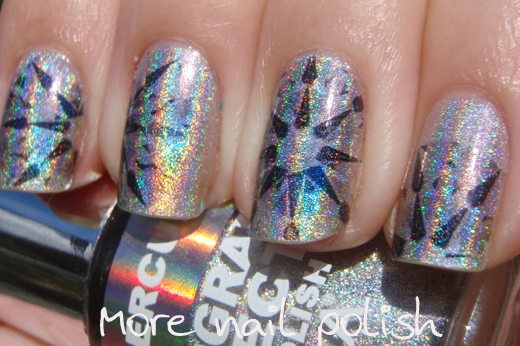 Cause sometimes holos can look a little uninteresting indoors when they aren't flashing all the colours around. I'm loving all the bling!! I think if you did just a sparkle or chrome polish with the diamond pattern it would translate better. 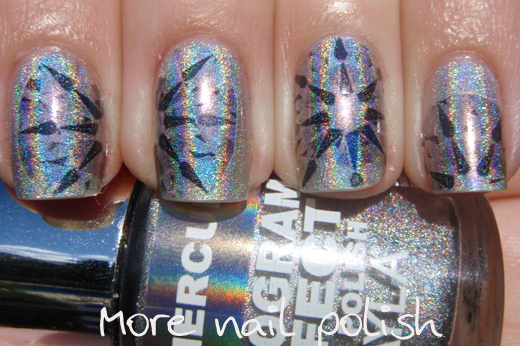 As you pointed out, it's that the holo hides the subtle shading, which gives it the starburst/glass shards look. I really love how it looks, so perhaps in the future you can experiment with a blue holo and silver stamp to purposely go for a star? That is a neat design, though! 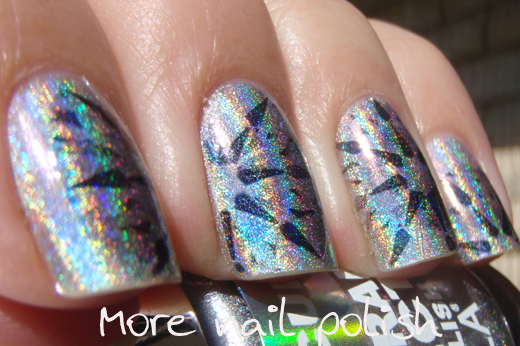 And you can never go wrong with holos! So neat! Kind of reminds me of snowflakes!! !